This Homz Replacement Cover fits all standard size boards (up to 54" long x 15" wide) and fits right over your existing Ironing Board pad. Constructed of 100% cotton, this cover features a draw cord to tie and secure the cover onto you existing Ironing board and an easy-on nose pocket for the perfect fit. The cotton material offers Scorchchield protection. Comes with a 3-year "fit" guarantee. Imported. This Homz Premium Padding Replacement Cover & Pad fits all standard size ironing boards (up to 54" long x 15" wide) and is designed with those in mind who iron up to 2-3 times per week. This is our 2nd best Ironing Board Replacement cover, always made with quality materials - constructed of 100% cotton cover and ¼” polyester fiber padding. This is a one piece construction and the padding is attached to the fabric of this replacement cover. This cover features a fitted nose pocket with elastic Stretch & Fit binding and Supergrip fastening straps for easy replacement of your existing cover and pad and a secure fit. The cotton material offers Scorchchield protection and features a stain resistant coating. Comes with a 7-year 'fit' guarantee. Imported. 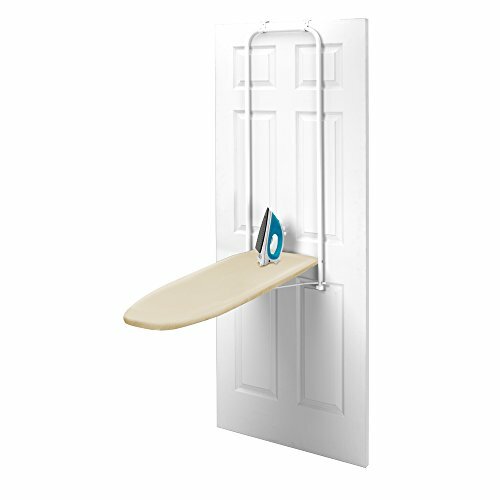 HOMZ Over-The-Door Ironing Board, installs quickly on standard 1-3/8" doors (no tools required). The 42" x 14" ironing surface is a mesh top for improved steam flow with bumpers that protect the door. It folds up or down easily with a patented design that locks the board when in storage position. Board comes with a 100% cotton cover and thick foam pad. The HOMZ Over-the-Door Ironing Board is proudly made in the USA. 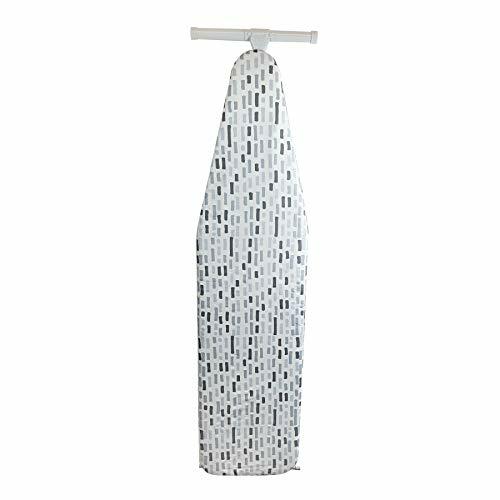 This Homz Ultimate Padding Replacement Cover & Pad fits all wide top ironing boards (up to 48" long x 18" wide) and is designed for the extreme ironer who irons on a daily basis. This is our most enhanced Ironing Board Replacement cover, always made with quality materials - constructed of 100% cotton cover double think ¼” foam padding and ¼” polyester fiber padding for maximum cushion. This is a one piece construction and the padding is attached to the fabric of this replacement cover. This cover features a fitted nose pocket with elastic Stretch & Fit binding and Supergrip fastening straps and Surelock Buckles for easy replacement of your existing cover and pad and a secure fit. The cotton material offers Scorchchield protection and features a stain resistant coating. Comes with a 10-year 'fit' guarantee. Imported. 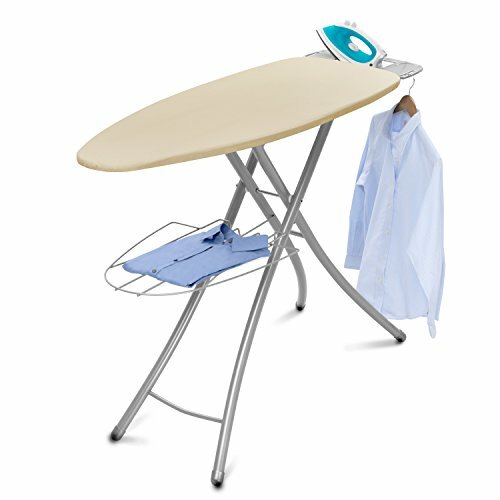 Professional Ironing System with large 18-inch wide steel mesh ironing surface 24-percent larger over standard boards. Professional 4-Leg for stylish stability and durability. Built in premium iron rest with silicone pads and integrated garment hanger. The patented leg lock insures easy transport while fully variable height adjustments to 39-inch for any comfort. Made in USA. The Homz Front-Facing Over-the-Door Ironing Board is the ultimate in convenience. 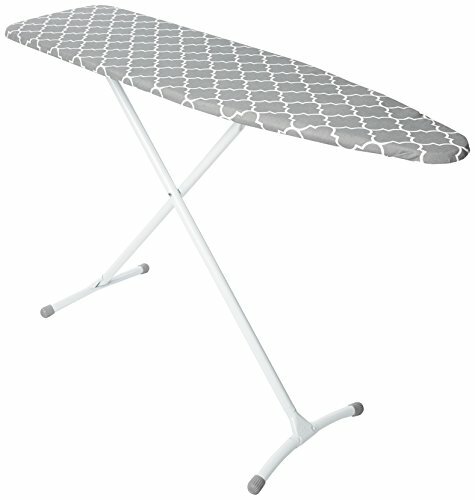 The steel mesh board top measures 49" x 14.25", slightly smaller than the typical floor standing ironing board, but large enough for most garments. The included metal hooks allow quick installation on a standard 1-3/8" door (no tools required). The board easily glides into position and locks into place. 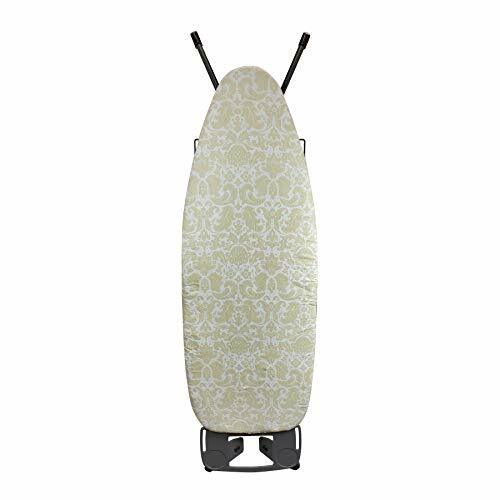 Compared to other over-the-door ironing boards which fold up for storage exposing the backside of the board, this one slides back into position showing the cover fashion. Folds away to just a 2" depth meaning it won't interfere with the door operation. Imported. The Homz premium countertop board is the ultimate in convenience and function. It features a steel mesh top that is 15% larger than other countertop boards. 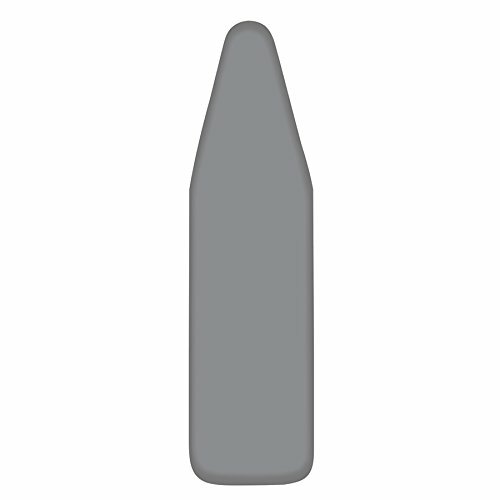 The 8" leg height and unique leg profile accommodate larger garments. It's lightweight and easy to store with a convenient hook that allows it to hang on the closet rod. The 100% cotton cover with foam pad ensures a smooth ironing surface. Great for crafts and quick ironing needs. Imported. Size: 00 x 183.00 x 18.00 x 60.75 In. 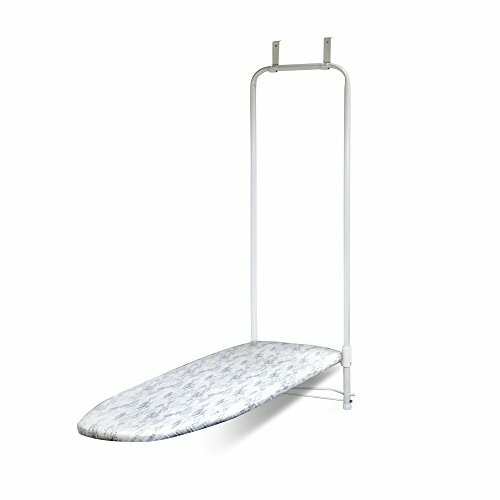 Want more Homz Standard Ironing Board similar ideas? Try to explore these searches: Party Challenge Bundle, Interchangeable Optics, and Goose Fountain.